This is it! The best way to deseed a pomegranate. You can enjoy this amazing fruit quicker and without the mess or the fuss once you know this simple trick. Have you ever wondered how to deseed a pomegranate? Properly, I mean. 🙂 This is definitely one of those things that come up in life where you think to yourself “Wow, there has got to be a better way!” Whenever you run into a situation like this, there usually is a better way and this pomegranate problem is no different! I saw a trick for deseeding them somewhere last year and I never really got the chance to try it out. When pomegranate season rolled around this year, I just knew that I had seen a trick for deseeding them, but I couldn’t for the life of me remember what it was! So I did some research and a bunch of (delicious) testing and here’s what I came up with. I feel like this method is the quickest, easiest, and least-messy one. For some pomegranates, you can work with them just like this by first pulling at the sides of your pomegranate half to sort of loosen things up a bit, but I find it’s a little quicker to work with quarters. It makes it a bit messier because each cut you make just spills out all that pomegranate juice everywhere, but it is faster. Next, grab a nice big-ish bowl and a piece of paper towel. Fold the paper towel in half and place it directly over the cut side of the pomegranate, whether you’re working with halves or quarters. Next, flip the whole thing over and hold it in one hand with the paper towel side down. Working over your bowl, grab a wooden spoon in the other hand and give the pomegranate about 10 good whacks all over! Put down your wooden spoon, grab the pomegranate with that hand and slowly pull away the lower hand along with the paper towel. All the seeds will just fall right out into your bowl! You may still have a few hangers on that are clinging to the peel, so go ahead and give the back of the skin a few more taps to release those as well. You can see there are quite a few juice splatters in my bowl just from releasing those last few seeds, so you can see why the paper towel over the hand is necessary! Just imagine what that bowl would look like it I was hitting it with the wooden spoon without anything to catch all the mess! Eek. That would be a disaster. The neat thing about this is that I was able to completely clear the fruit of all of its seeds without having to touch a single seed with my hands! So no messy red-stained fingers! …OK I have to admit that picking the seeds out with your fingers is fun and kind of satisfying, but it’s nice to have an option now! 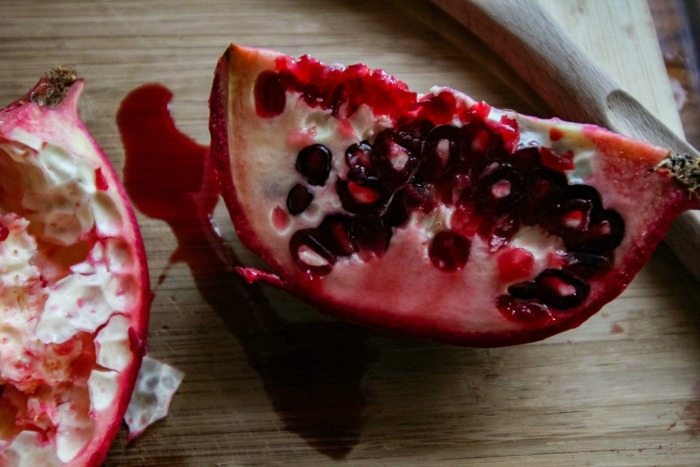 Have you tried this trick to deseed a pomegranate? What’s your favorite way to use pomegranate seeds at this time of year? How to Clean Your Microwave Naturally With No Scrubbing! What a totally awesome tip! I will be going to pick some up soon. I am the only one in the house that likes them so I won’t be able to get the wife to get them. Also with this being the day before Thanksgiving I will not be going to the store today. I can’t wait to try this though, so thanks and have a great day tomorrow! I live in Brazil and have a pomegranate tree in my yard – never use it because I thought it was too complicate do deseed it! Thanks a lot! Awesome! You’re so lucky to have a pomegranate tree! So glad my little tip will be useful to you!